All weekend enjoy the delicious hot dogs and shaved ice from J 'n W's! Check 'em out on their Facebook Page. PLUS... The amazing seafood of Krab Kingz Seafood. Learn more on the Krab Kingz Facebook Page. 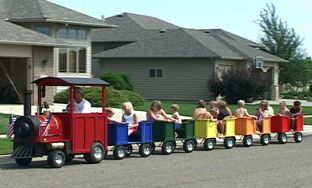 Enjoy a ride on the trackless party train: Choo Choo Express. It's safe and fun for the whole family, and a nice way to experience the gardens. There is an additional fee for train rides. See ChooChooExpress.com for more.